Buyers (often also called purchasing agents, or purchasing managers) play an important role in every single company. Evaluating and buying products for their employer, they have a direct impact on the sum total of expenses, and on the quality of the final product. Bearing this in mind, companies choose their buyers carefully. You can expect a difficult interview. More than anything else, they will test your skills and attitude with a variety of behavioral questions. Your answers help them to understand how you’d handle different purchasing situations, if you have the right attitude–if you have the employer and the final customer always on your mind. They will also ask you a few personal questions, trying to understand more about your motivation, and basically who you are, and what you like the do in life. 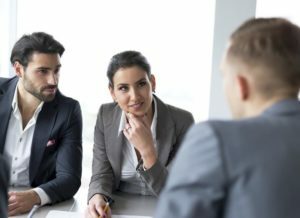 In this article we will analyze both groups of questions, and help you to find great interview answers. Let’s start! Why do you think you can become a good buyer? Describe a difficult negotiation you had with the supplier. What was the outcome? What do you consider more important–price, or quality of the product? Imagine that you really wanted a product from a certain supplier, but could not offer the pay the price they asked for it. What would you do? Do you think it is worth visiting the suppliers personally, considering the expenses associated with such visits, and the time it takes? This is a question of motivation. In a good answer you should actually cover two things: 1. Why you applied for a job of a buyer. 2. Why you applied for the job with them, and not with some other company. You can start with the first one, saying that you enjoy doing what purchasing managers typically do, that you have strong analytical and negotiating skills, and believe you can be useful for an employer while working as a buyer. Saying this, you demonstrate the right attitude–thinking on the employer and their results, and not only on your own paycheck. To the second one (why you applied for a purchasing agent job with them), you should point out that you have good understanding for their industry and for the products they purchase. But you can also say that you like their company, the working environment, their vision and final products, or anything else. The key is to clearly show that you did not apply with them by a chance (even if you did). You have a few options here. If you worked as a buyer before (and did a god job), you should refer to your past experience. Experience definitely helps in this profession. You can also talk about any other relevant experience, any job when you used your negotiation skills, sales skills, analytical skills, or anything else relevant. And what to say if you apply for your first job? Even in this case, you should trust in your own abilities. Tell them that you have the analytical, accounting, and negotiation skills, and that you are eager to learn from more experienced colleagues (other buyers). Look at the job description for some help. In my experience, daily job of a buyer can vary a lot, depending on the industry, the number and variety of items they purchase, and also on the price per item. Some buyers spend the entire day on the phone, and at their computer. Other purchasing agents will travel to meet the suppliers in person, do the quality check on place, and try to negotiate the best deals directly in the company. Anyway, tell them that you imagine doing a lot of work, and are not afraid of making cold calls, visiting suppliers, and negotiating the best conditions of the deal. Show them that you like to be busy in work. Perfect jobs do not exist. Even if we truly love what we do, we will find some tasks difficult, and we will be reluctant to do them. In the work of the buyer this can be negotiating the prices, cold calling, internal discussion, market analysis, or anything else. The key is to always elaborate on your answer, saying that you understand the importance of the task, and therefore you’ll take care of it–even though you do not feel great about doing it. Everyone wants to make the most, to have their fraction of the pie. Negotiations are not easy–if you have any experience under your belt, you for sure know that. 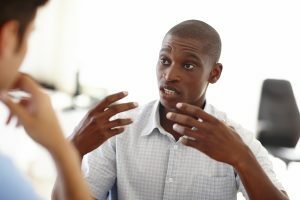 The key is to talk about the negotiations in a calm voice, clearly explaining the goals you had, and why you could not accept the initial offer the supplier made. Doing this, you again show the right attitude (employer first) and also demonstrate your understanding for the business and job of a buyer (saying that you could not accept the offer since according to your calculations the price was not acceptable). We live in a global world. If we struggle to sign a reasonable contract with one supplier, we can always try with the next one. The right answer to this question is not straightforward. For example, if you worked for a chain of souvenir shops, you’d definitely look for the cheapest price. Quality does not matter for most city visitors. They just want their souvenirs, and in an ideal case they do not want to pay a lot of money for them. On the other hand, if you worked as a purchasing manager for a stylish top-class restaurant, you’d go for quality. And you would not care much about the price, becasue price is not a concern of the people who dine in luxury restaurants. If the ingredients are expensive, the luxury restaurant will simply raise the price of particular dish. And the snobs will pay the price :). Study the job offer carefully, and think whether price matters more, or quality. And if you are not sure, say that you’d always look for the best ratio of price and quality. Here you have a few options. For example, you can suggest offering them a long term partnership, in exchange for a better price. Or you can suggest doing a free promotion for them, on your social platforms, mentioning that you use their products in the production process. Another alternatives are exclusivity, ordering bigger quantity (if possible), offering barter services or free final products for the managers from the company, etc. Everything depends on the budget, the importance of the deal, and the negotiating power you got from your employer. Once again, the answer to this question is not straightforward. Let’s say that you want to buy bio-quality cherry tomatoes for the luxury restaurant, and you will need them on a regular basis (that will typically be the case, since many dishes contain tomatoes). In this case, it definitely makes sense to spend time and money and visit the farmer/distributor. This allows you to see the quality of the production, the conditions on the farm, and other things. What is more, face to face contact still wins in business. You can’t make the best deal on the phone, and personal relations are irreplaceable. If you are planning to buy tomatoes from someone for years to come, you should definitely visit them, even regularly. Let’s look at another situation: the restaurant makes a special menu for one week–Greek menu. Your task is to get a high quality Greek olive oil and sheep feta cheese. This is a one-time purchase, since the restaurant won’t run the “Greek week” promotion more than once a year. Perhaps they won’t do it ever again. Therefor in this case it won’t be cost effective visiting the suppliers. Everything depends on the situation. Choose your answer accordingly. You are assigned a task to purchase a certain product (can be anything). Tell us what steps you will take. Imagine that you struggle in communication with the marketing and production department, and can’t get the information you need from them. What will you do? Why should we hire you, and not one of the five other candidates who also apply for this buyer position? 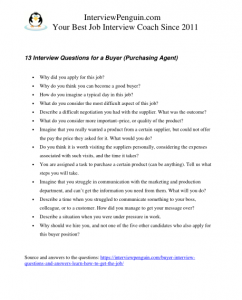 Interview for a job of a Buyer belongs to difficult interviews. You will have to deal with personal and behavioral questions, and many answers won’t be straightforward. What is more, since high school diploma suffices for this job, and it pays well, you will typically compete with other people for the position (can be two, five, but can be also twenty). In order to succeed, you should prepare for the challenges. Practice with the questions from this article, and think about good answers. And if you are not sure, or look for a quick way of getting ready, consider purchasing our inexpensive Interview Success Package. Brilliant answers to thirty most common interview questions (including the difficult behavioral questions) and a guide on how to make a best possible impression on the hiring managers, will make your life ten times easier in the interviews.